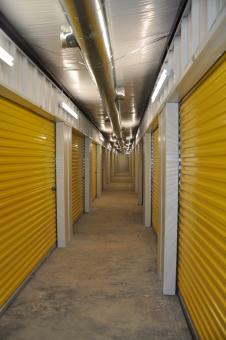 Let our standard storage units and climate controlled storage units help you get organized and clutter free. Your satisfaction and convenience is our priority. We want to make your storage experience as easy and convenient as possible with our easy access locations in Sikeston, MO and New Madrid, MO. We have a range of sizes available at competitive monthly rates. Our units are easily accessible with wide aisles. Security cameras and keypad entry help secure your valuables. Our range of standard storage units range from small to very large with easy access with either drive up or drive through access. All doors are roll up doors with the larger units having two roll up doors at both ends. Superior outdoor lighting makes unloading easy and safe. Wondering what size unit you will need? Our quick guide should help. A 5 x 10 unit contains 50 square feet of space, comparable to a large walk-in closet. This size unit could store items from a studio or small one bedroom apartment, or about 70 file boxes with room left to walk. A 10 x 10 unit contains 100 square feet of space--about what you would expect in a small bedroom. This would store roughly the furnishings from a one bedroom apartment or 200 file boxes with room to walk. A 10 x 15 unit contains 150 square feet of space, comparable to the space in a large bedroom. This size unit can store the furnishings from a two bedroom apartment or 300 file boxes with room left to walk. A 10 x 20 unit contains 200 square feet of space. This is roughly the same space found in a one car garage. This unit area can store furnishings from a three bedroom home, a truck, or 370 file boxes with room left to walk. A 10 x 30 unit is 300 square feet of space and compares to a two car garage. A unit of this size can store furnishings from a three or four bedroom home, or a full size car or truck. Has two roll-up doors for easy access and allows a truck and trailer to drive straight though the unit. A 10 x 36 unit is 360 square feet of space and can contain the contents of three or more bedroom house. Ideal for commercial use. 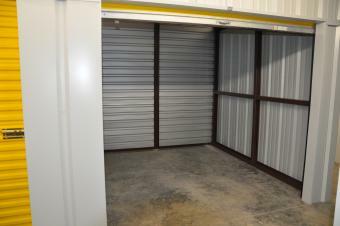 Units equipped with two garage doors allowing for easy access on both sides of the storage unit. This unit is similar in size to a 2 car garage. These estimates are only approximations. We offer our customers a variety of storage unit sizes and with our low prices, you will find just the right price and size to fit your storage needs.